We believe that Ares Capital (ARCC), a business development company, is a one that should be on your radar. Most specifically, the dividend appears to be more than safe, because there has been consistent coverage. In this column we review a few key metrics and management comments that you should be aware of. The waiver of income fees is something you need to be aware of. In connection with the ACAS acquisition, Ares Capital Management LLC has agreed to waive up to $100 million in income based incentive fees for ten calendar quarters beginning Q2 2017 (up to $10 million per quarter) to support the dividend of the combined company during the integration and portfolio repositioning period. For the quarter ended September 30, 2017, ARCC had non-interest income of $56 million compared to base case projected $50 million. 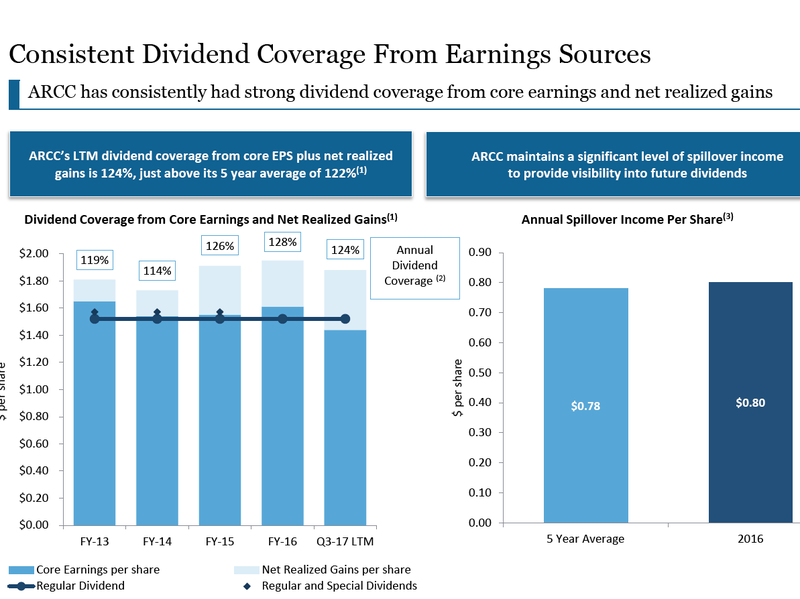 Net investment income was around $0.36 per share and net realized gains totaled $0.08 per share to help cover the current quarterly dividend of $0.38 per share. Further, the company had around $0.80 per share of undistributed income carried forward into 2017.